Wonderful to see so much of your work together.You are so very creative. I loved your statement. Just discovered your book! Great stuff. STUNNING! YOUR HORSE PAINTINGS ARE AMAZING! I MUST ADD SOME TO MY JANE LIDZ COLLECTION! Dear Jane, Your artworks are exceptionally touching and beautiful. They are soul inspired. The three dimensionality of the four season tree embracing the heart captures the essence of the cycle of live and all its complexity. The detail and colors are amazing. How wonderful that it generated so many blessings. This is a beautiful website to show fantastic pieces of art. Your heart pieces are warm, unique, funny, deep and present just like you! I'm so glad to peruse the site, and take its fabulous contents into my day! Thank you so much for sharing it! Your brilliant website captures your magnificent presence and sweet, warm, massive heart. When I noticed you included Heart of Jazz (which I proudly and gratefully own), my heart skipped a beat and I was consumed by the urge to buy it again! What a pleasure it gives me every time I see it in my home. Thank you for blessing us with your work. A fabulous site for a fabulous woman! Hi Jane - I stumbled across your work on this site - Love your work! Many years ago you photographed interiors for Hodnick Design and Kenneth Rodrigues Associates - ID Two, Plaza Bank of Commerce - which are probably a faded memory. Great to see this other direction of your artistry. We're all sitting here watching your work and are very impressed with it! 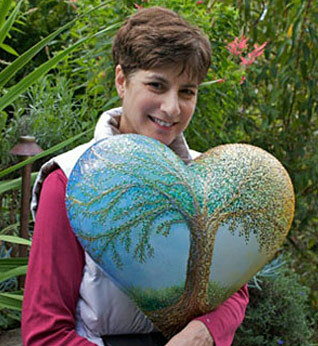 Jane, I have been a fan of your work ever since I saw your Heart displayed in the Macy's storefront, during the San Francisco Hearts and Heroes Gala in 2010! You truly have an wonderful gift and your work is amazing. You have such a unique way of blending different mediums and colors to create an amazing art piece! Keep up the great work and glad to see more of your items on here! I own seven paintings by Jane Lidz whose work fills me with harmonious delight. Hanging on the Western wall of my living room is a painting of a beach merging with the deep blue Pacific Ocean as the sun goes down. Perfect any time of day. My study wall holds hearts of red, gold, blue and green which represent the four seasons. In my bedroom is an abstract of white with subtle pastel under tones. The most tranquil is a painting of a golden beach layered with smooth grey stones. Jane, your paintings are so vibrant , colorful, and creative ! I love the painting I own of wild horses. I never tire of it . Your heart series is one of my favorites . Seeing them in person has been a treat since every small square is packed with exquisite detail in texture and novelty. I hope you will keep sharing your gift and I certainly encourage people to give your work a look!